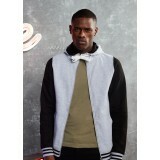 Twin Needle Stitching Double fabric hood with self coloured cords Kangaroo pouch .. 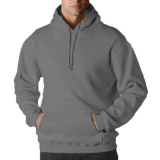 Double fabric hood Contrast raglan sleeves Kangaroo Pouch Pocket 80% cotton..
Hoodie Kangaroo pouch pocket Same colour outer/ drawcords 80% cotton 20% poly..
Twin needle stitching Double contrast hood& inner/ drawcords Kangaroo pouch p..
Twin needle stitching Double fabric hood Kangaroo pouch pocket with small hidden ..
3 panel hood with contrast single Jersey fabric inner contrast sleeves knitted cu..
Contast electric colour sleeves Contrast electric colour studs Hidden ear phone l..
Press Studs to fasten Knitter Collar, cuffs & waistband with stripe details C.. 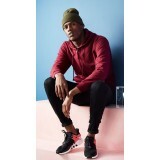 Fabric Type 80% Cotton 20% Polyester Weight 280gsm Full zip hoodie with..
· 80% cotton/ 20% polyester · &nbs..